This entry was posted on September 2, 2016 by Josh Biggers. 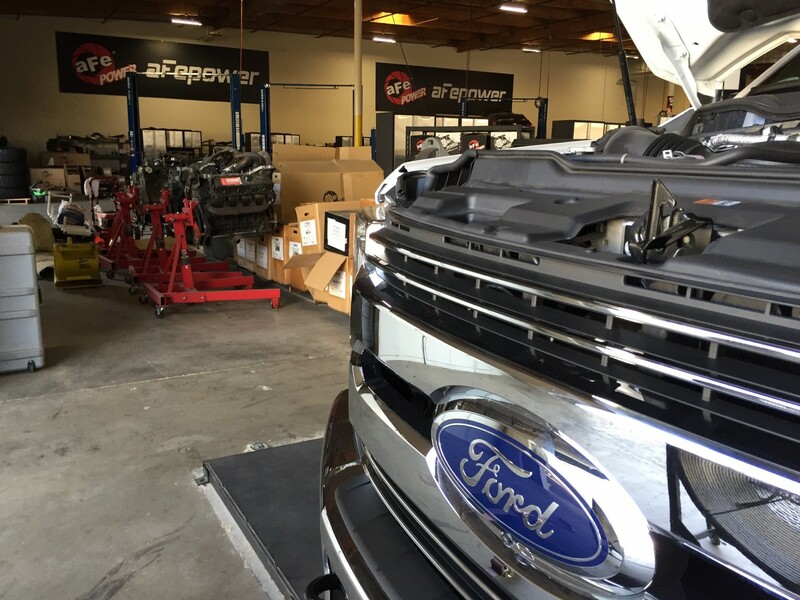 aFe POWER is known for developing performance products on diesel trucks, naturally given the opportunity to work on the new 2017 Ford F-250 the engineers jumped. You may ask yourself why the new F-250 is such a big deal, well here are several reasons why the new F series is improved for 2017. Lightweight strength was achieved without losing structural integrity. Just like its smaller brother the F-150, the F-250 sheds some weight off with high-strength aluminum. Approximately 350 pounds were lost, but while many will doubt whether or not this truck can handle massive payloads, a stiffer frame, stronger axles and suspension components have been upgraded to compensate. 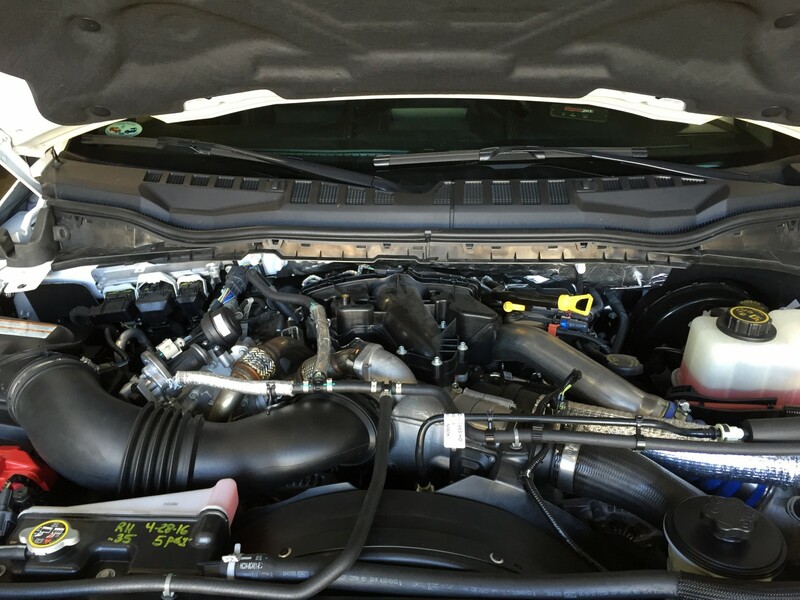 Powering this F-250 is a 6.7L Power Stroke turbo diesel V8. New engine updates helped produced an impressive 440 HP and 925 lb-ft of torque at the crank. 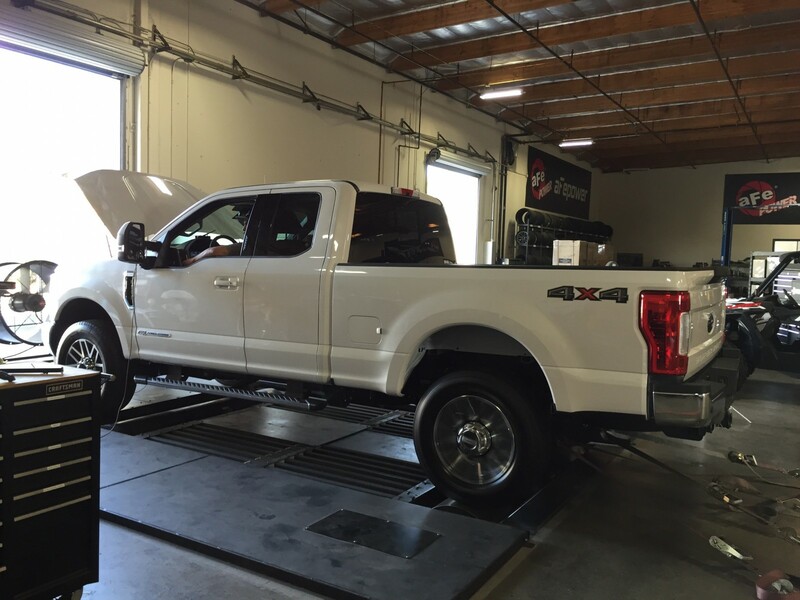 While stock out of the box the truck delivers admirable performance, at aFe POWER we don’t know the meaning of the word “stock”. We are the first to strap this powerful workhorse to a dyno and see what it puts down at the wheels. 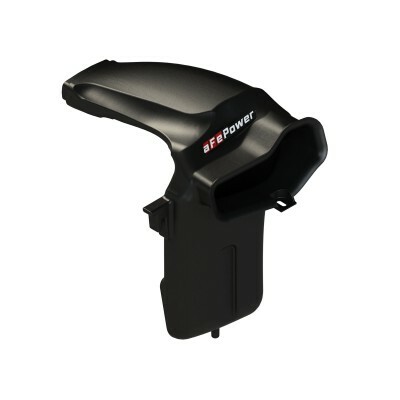 Future products to keep an eye out from aFe POWER is our Scorcher Tuner Module, Momentum GT Cold Air Intake System, exhaust system upgrades and more! As mentioned before we needed to do a baseline run to see what we are working with in stock trim. 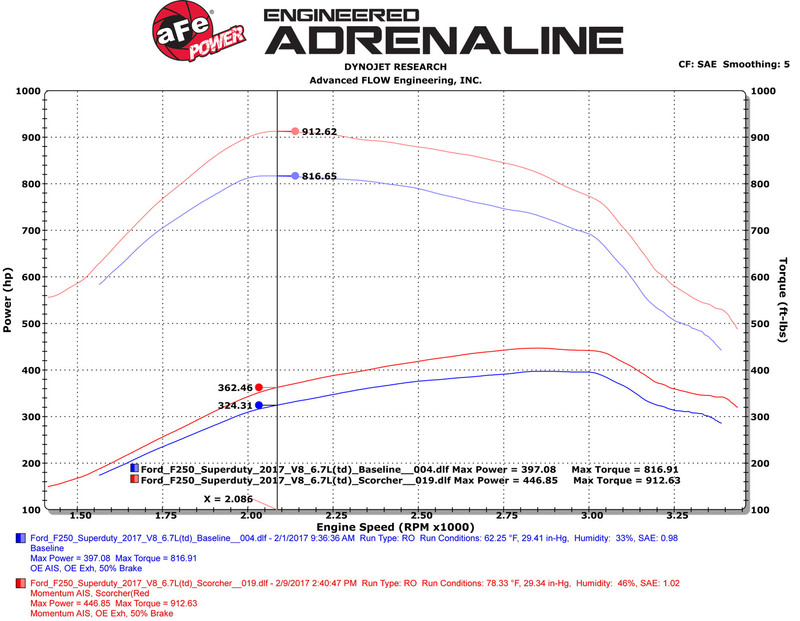 We use our in-house dyno jet as a tool to visually see what performance gains our products will improve upon. In this case, we are testing our Scorcher HD Tuner Module for the 2017 Ford F-250 with the 6.7L V8 engine. Ford's new F-250 is certainly a torque monster, producing over 800 Ft. lbs of torque to the wheels at 2,000 RPM! Obviously, that much amount of torque helps when pulling heavy loads from destination to destination. 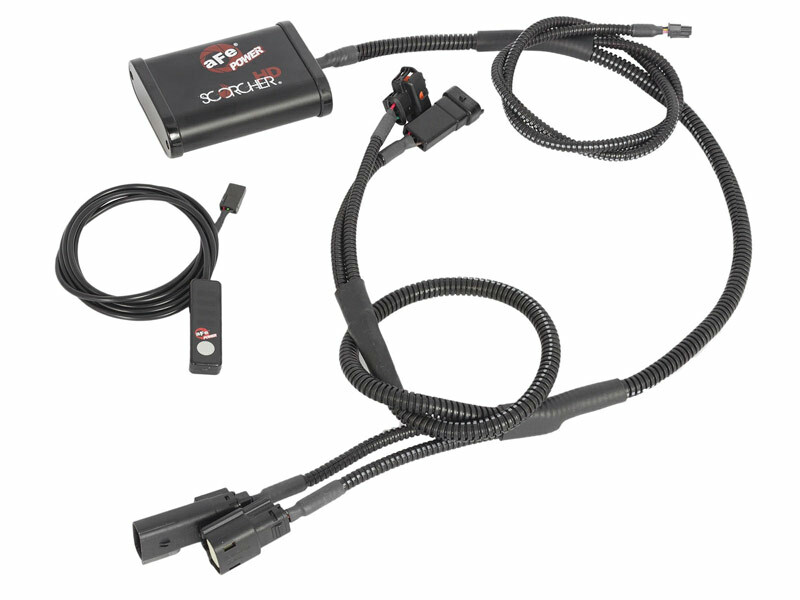 But there’s always room for improvement, the aFe POWER Scorcher HD Tuner Module will increase your Power Stroke diesels horsepower, torque and throttle response. Whether for pulling, cruising, or even hitting the local drag strip for fun, our tuner module will not leave you disappointed. Unlike other handheld Tuners that will flash your trucks computer and risk voiding your warranty. Our module leaves no trace on the ECU for the dealership to pick up upon scanning, we achieve this obstacle by altering the pressure sensor signals to increase boost and fuel levels to an optimum point throughout the entire RPM range. As with all of our Scorcher Modules, no cutting, drilling, or splicing is required for a quick and hassle-free installation. We connect to the stock wiring harness with factory connectors to ensure a seamless install. Our new generation of Scorcher Tuner Module allows you to change between power settings without having to get out of your truck. 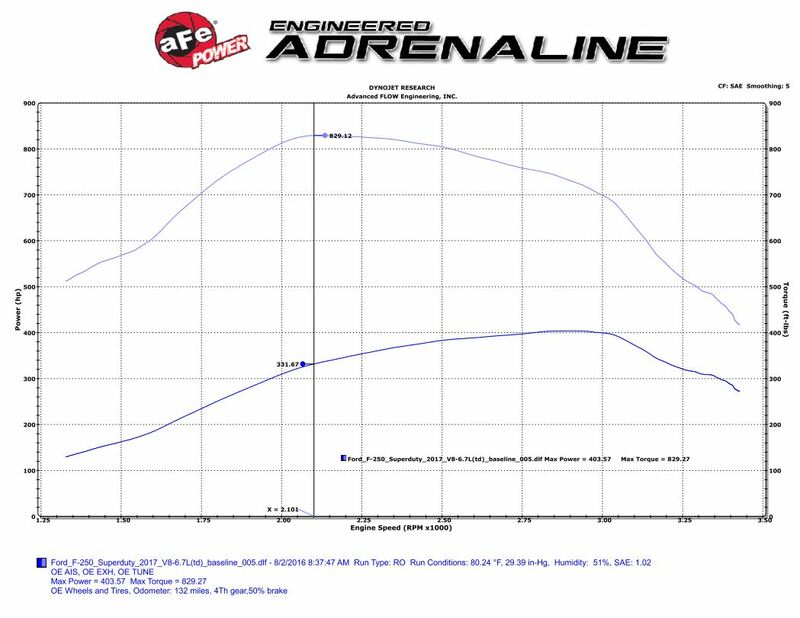 Our Scorcher Module works with all aFe POWER upgrades, increasing their effectiveness with the additional fuel and boost for more horsepower and torque. 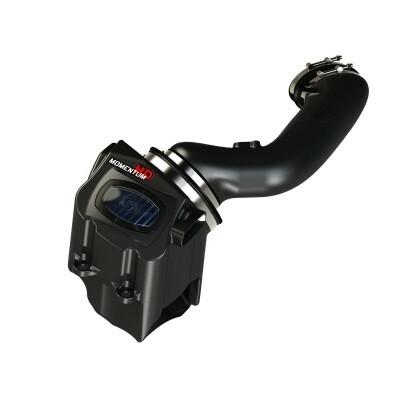 Along with our Scorcher HD Tuner Module, we are developing other products for the 2017 Ford F-250 6.7L Power Stroke such as an intake, exhaust systems and suspension upgrades. This combination takes the stock Power Stroke from the rated 440HP and 925 lbs. x ft of Torque to 496HP and 1,031 lbs. x ft of Torque! 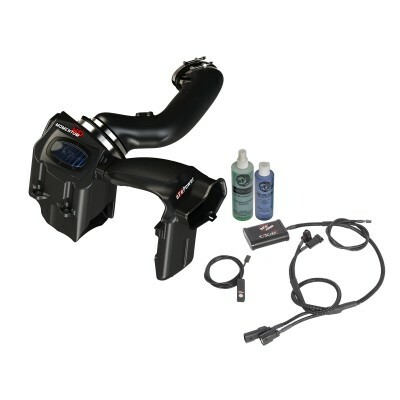 Do you have the tuning module and intake kit for the 2018 powerstroke? Mine is a 4x4 crew cab lariat.